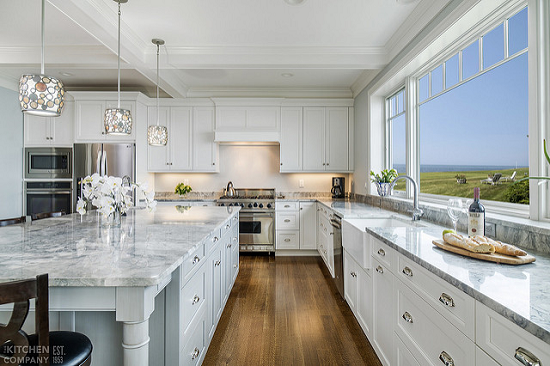 Simple Interior Concepts: Is It Wise (or not) to Use Marble for Kitchen Countertops? Is It Wise (or not) to Use Marble for Kitchen Countertops? As a kitchen countertop, marble is really very attractive. With its beautiful sheen and characteristic veins, marble worktops have been the first choice of many homeowners. Some believe it is even more appealing than granite and slate. Kitchen cabinets with marble countertop. Notice its lustre and beauty, but how long will this retain that shine? There is no doubt that marble possesses a classy timeless look, asides the fact that it is sturdy, heat resistant, and easy to clean, just like granite, but its life-span is shorter. Not only that. With time, marble gets pitted and scratched as it ages, not so with granite or quartz. Also, because marble is porous, it retains stains if it's not carefully managed. For instance, if you accidentally spill some red wine on a marble countertop, if it’s not cleaned off within some minutes, the wine will gradually seep through (marble is porous) and become stained. This stain cannot be removed entirely. Same will happen if you spill something like turmeric drink or beet juice. The stain becomes hardset if it's left on the counter surface for more than ten minutes. And because of marble stone's porosity, it can become a breeding surface for bacteria and salmonella if say, you cut and prepare foods like meat and fish directly on its surface and not clean it up thoroughly after. Having said all this, marble is still a great natural stone material for your kitchen countertop and with good maintenance and extra care, it can last for quite a long while. It may not retain its initial glossy looks after a couple of years or so, but you can always have it re-sealed/re-glazed if the dullness bothers you. It has a beautiful glazed sheen when polished, and its natural colours and hues make it a popular choice of solid worktops not only for kitchen worktops, but for flat surfaces and counters in hotels, clubs, and restaurants.